Romancing the Genres: SHE'S GONE COUNTRY! There’s an old saying: “Hindsight is 20-20.” Looking back on my family’s move to a fairytale-beautiful acreage in the country, I must agree that the view from four years on is not at all what we expected. Four years ago, Chuck and I and Son 2 and his family moved onto four acres of woods and pasture thirty miles outside of Portland, Oregon. 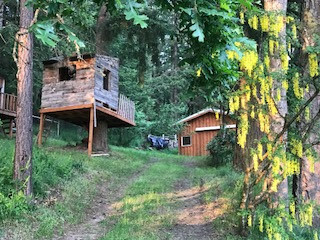 The property sits on a hillside overlooking a small valley in the foothills of the Cascade Mountains. This is one of the most beautiful spots you could ever find! 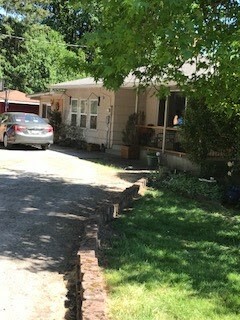 The original plan was that Son 2 and his wife would finish college (both were returning students) and build a house on the property. Meanwhile they and their four kids would live with us in the big four-bedroom house. Son 2 worked for his dad in his home-based consulting business and attended classes at a nearby technical college. Our daughter-in-law commuted to PSU in downtown Portland. Chuck was the only one of us with any livestock experience. Although he grew up in the city, as a teenager he had a horse and worked off boarding fees cleaning stalls and doing odd jobs at the stables. He also worked in a nursery and was in Future Farmers of America in high school. Thank God for that! I’d always wanted alpacas. Chuck bought me three for Mother’s Day. He and Son 2 built them a shed in the pasture during a week of pouring rain. (I’m sure it was an omen.) We rented a horse trailer and went to get them. My first inkling that alpacas weren’t exactly the animals I thought they were came when the lady we bought them from put on a raincoat “because they won’t be happy about getting in the trailer, and when they’re not happy, they spit—a lot!” She wasn’t kidding! Suffice it to say it took four adults to get them into the trailer. 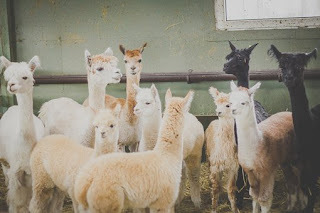 Alpacas look like friendly, cuddly animals. They are more like aloof cats. Sometimes crabby, seventy-pound cats that may kick or body-slam you when you least expect it! Soon we added free-range chickens and three baby goats to the livestock. The chickens were fun to watch and the eggs were wonderful, but they dug up the flowers and pooped all over the porch. In fact, dealing with poop—alpaca, chicken and goat—occupied a lot of our time. It’s the hardest part of having livestock, in my opinion. The only thing harder for me was worrying about the livestock because to me, they were pets. I worried about coyotes attacking the alpacas down in the pasture all the time. The only defense alpacas have is running away and bleating an alarm call. Put them in a pasture, and they can’t even run away. Luckily, the coyotes stayed away. But false “alarms” had me running down to the pasture every other day. They bleated at the neighbor using her walker to go down to her mailbox. They bleated at people walking and cycling on the main road. They bleated at the garbage truck. Never once did they bleat at anything dangerous! 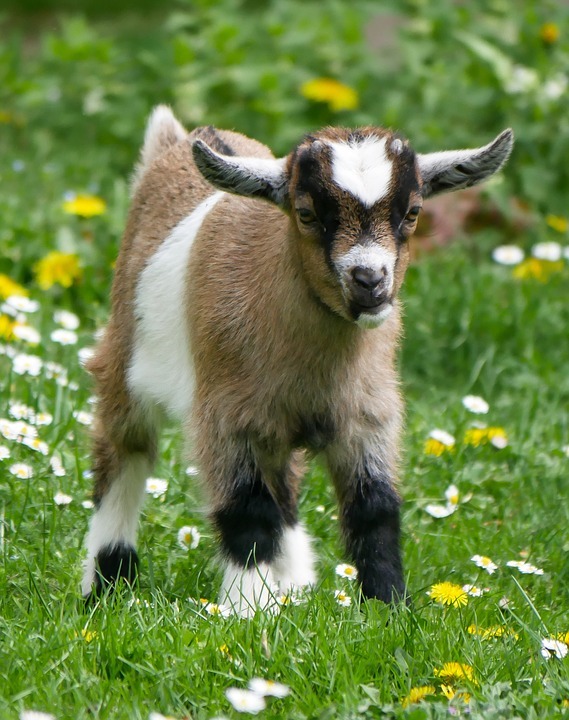 I worried about the goats eating something poisonous, because the people who lived on the property before us had landscaped with trees, bushes and flowers that are poisonous to goats. At night, we kept the little goats in the barn in the woods above the house. The alpacas wouldn’t let them into their shed in the pasture. 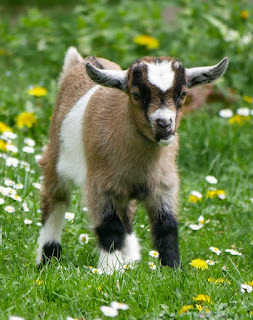 So every morning we had to walk the goats down to the pasture past all the tempting poisonous plants, and every evening we had to take them back up to the barn. Galen’s family helped with chores, but he and his wife were gone most of the time and the kids soon tired of farm life. Before long they realized they are city folk at heart. They moved back to Portland. Business took a downturn and we learned Chuck needed knee replacement surgery. Most of the livestock chores fell to me. I didn’t think we could hold onto the property financially, or that we could handle the work load. We sold the livestock and consulted a realtor. Our dream of life in the country was in tatters. Luckily, we made it through the winter and Chuck recovered from surgery. Then my disabled daughter and her husband and grown daughters moved out from Iowa. After a while, my daughter and her husband moved onto our property in their fifth-wheel trailer. They pay a little rent and our son-in-law helps a lot with chores. One of our granddaughters and her husband rented the basement from us for a year. We were able to refinance the house. We made it through! Business is good again and we are even considering getting two goats to help clear out the brush in the woods. This time we will know what we are getting into! They will live and ‘work’ on the same area of the property. I true country fashion, we’ll re-purpose a playhouse to be their goat shed. Have you ever moved from the city to the country, or visa-versa? What did you find most surprising? I'm Sarah Raplee, Paranormal Romantic Suspense Author of Blindsight,Psychic Agents Book 1. Wow. My husband and I occasionally talk about moving to a remote location--though animals aren't part of the draw. I'm glad you were able to survive the bad times and that your country living dream is now back to dream and not nightmare. We started vacationing in upstate NY when the kids were babies. We found a Glatt Kosher Farm/Ranch in Gilboa NY. Golden Acres. We vacationed there for 25 years. Every year we'd pack up and move into our efficiency apartment on the farm on the deck we shared with 7 other RETURNING families. As the kids got older and married they also returned to the farm with their families and worked in various positions. Son #1 was the head wrangler in charge of the horses, his wife was the dining room hostess. Their kids went to day camp. We know country very well. The local staff/baby sitters, introduced us to their families who taught us how to pick and choose fresh fruits and veggies for the best quality. Son #2 and his family have a vacation home in W.Goshen NY right across from the Ashoken Reservoir and 15 minutes from Woodstock. WE ARE CITY AND COUNTRY!!!! Oh, and my wife and I would love to be able to buy or build a country retreat to retire to. Somewhere up near Hunter Mntn or even further up on Lake George. Wow, NoraA, you most certainly are!!! Good luck on your plans for the future. We did that, 44 years ago. We're still here, but the property doesn't look very much like it did back then. There were four acres of cherry trees that we quickly learned were not a good crop for this valley. 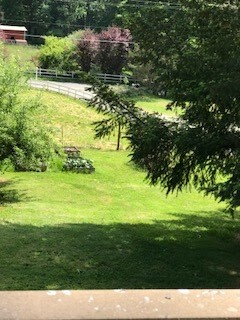 Jim took out the trees and fenced much of the property as pasture. We have 11 1/2 acres. Our daughter had a pony when we moved here, and Tika stayed even after our daughter left home. Jim bought a hunting horse, but didn't ride it enough. We also had a cow and calf who were notorious for jumping the fence at the top of the property and roaming around in the vineyard. We also had chickens and turkeys and geese and I don't know what all. Jim loves poultry. Now we're down to one cat who sleeps in the pole barn and nine chickens in the big house. 15 young chickens are in the brooder house and growing quickly. Jim takes care of the animals. I forgot to say, I'm actually a city girl. I was born in Los Angeles. This country living was an adjustment for me, but I'm still here. Enjoyed the recap of your move to the country. Make sure the goats you get are ones who can fend for their selves. They do exsist! Your goats were the first ones I ever heard of that you had to pull up plants for. In MI the goats worked the fields and edges of the hwy keeping weeds down. Good you stuck it out and best of luck with your future endeavors.